Left to right: DOE Superintendent Kathryn Matayoshi, Koloa Elementary Principal Debra Lindsey and Island Insurance Foundation President Tyler Tokioka. 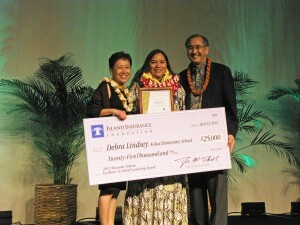 The Island Insurance Foundation presented its eighth annual Masayuki Tokioka Excellence in School Leadership Award of $25,000 to Debra Lindsey, principal of Koloa Elementary School on Kauai, at the annual Public Schools of Hawaii Foundation Dinner held on April 13, 2012 at the Sheraton Waikiki Hotel. 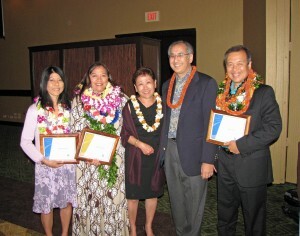 The award, named in honor of the late Masayuki Tokioka, founder of Island Insurance Company, Ltd., is presented to a public school principal who is visionary, community-minded, and has an entrepreneurial spirit – qualities of leadership that Tokioka exemplified in his own company and in the business community. “Principal Lindsey exemplifies the type of leadership that can transform our public schools into model learning institutions,” said Tyler Tokioka, Island Insurance Foundation President. “By recognizing outstanding principals such as Debbie, it is our hope that her accomplishments will inspire others in public education,” Tokioka added. Left to right: Janette Snelling, Principal of Kohala High School; Debra Lindsey, Principal of Koloa Elementary School; DOE Superintendent Kathryn Matayoshi; Tyler Tokoka, Island Insurance Foundation President; Justin Mew, Principal of Niu Valley Middle School. Lindsey received $15,000 for a school project of her choice and an additional $10,000 cash award. The Island Insurance Foundation also presented a $2,000 cash award to the top two semi-finalists, Principal Justin Mew of Niu Valley Middle School (Niu Valley, Oahu) and Principal Janette Snelling of Kohala High School (Kohala, Hawaii Island). Eleven candidates were nominated for the award. They each received $1,000 and a commemorative plaque, which were presented to them at a recognition ceremony on March 31. The other eight nominees are: Disa Hauge, Maili Elementary School (Waianae, Oahu); Lanelle Hibbs, Kailua Elementary School (Kailua, Oahu); Meredith Maeda, Castle High School (Kaneohe, Oahu); Fern Markgraf, Kahului Elementary School (Kahului, Maui); Robin Martin, Shafter Elementary School (Honolulu, Oahu); Marsha Nakamura, Lahaina Intermediate School (Lahaina, Maui); Ruth Silberstein, Palolo Elementary School (Honolulu, Oahu); Brenda Vierra-Chun, Wheeler Middle School (Wahiawa, Oahu). Teachers at Koloa Elementary are looking to continue their efforts to improve classroom instruction through training and coaching. The school uses the sports term “coaching” as a reference to those who come off the bench to help the team. It views “coaching” students as a critical component of its instructional program and ultimately its success. Today, Koloa Elementary is now identified as a model school by the Department of Education. Lindsey plans to use the award to continue the schools efforts to improve classroom instruction by securing an educational consultant to develop a system of sustainability, (primarily for “coaches”) to help the school sustain itself for the future. An educator for 31 years, Lindsey has been principal for 15 years, six of which have been with Koloa Elementary. Criteria for the award were based on research done by the Center for the Study of Teaching and Policy at the University of Washington. The study concluded that school leaders can advance powerful and equitable learning by: establishing a focus on learning; building professional communities that value learning; engaging external environments that contribute to learning; acting strategically and sharing leadership; and managing improvement activities based on student performance data. 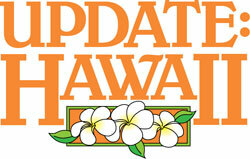 The awards program is being administered by the Public Schools Foundation of Hawaii. An immigrant from Japan, Mr. Tokioka moved to Hawaii at age 12 and graduated from McKinley High School in 1921. He earned a Bachelor of Arts degree at the University of Hawaii at Manoa and a Master of Business Administration degree in international commerce from Harvard University in 1927. His business career spanned 70 years, during which he founded several successful enterprises such as the Island Insurance Companies, International Savings & Loan Association, Ltd. and National Mortgage & Finance Company, Ltd. He was also a driving force in establishing many community-focused entities such as the Hawaii Immigrant Preservation Center, Crown Prince Akihito Scholarship Foundation and the Japanese Cultural Centers in Hawaii and San Francisco. The Island Insurance Foundation was established as the charitable arm of Island Insurance, Hawaii’s largest locally owned and managed P&C insurance carrier. Island Insurance holds financial strength ratings of “A” by A.M. Best and Fitch Ratings and is the only Hawaii-Based company to be recognized as one of the Top 50 property & casualty insurance companies in the nation by the Ward Group for four consecutive years. 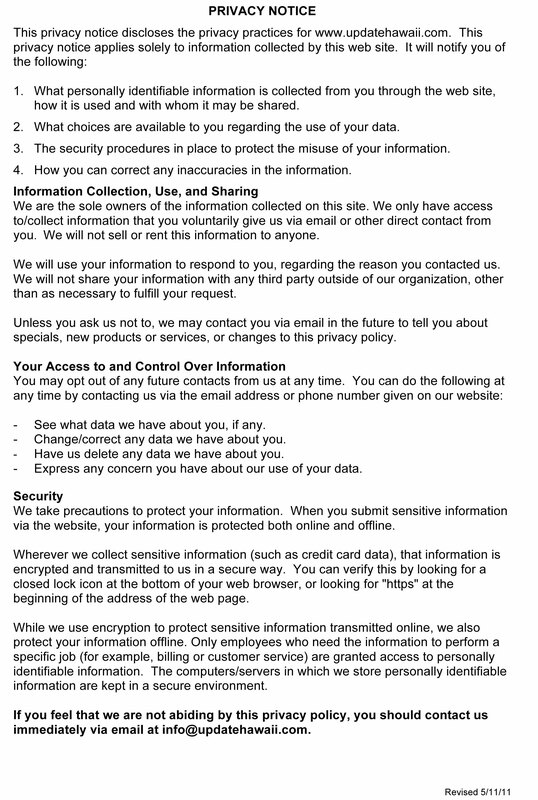 For more information, visit its website at: www.islandinsurance.com.